For the past 16 years, Kathy has owned Bright Spot Dog Training. Services include consulting with families about their challenging dogs, teaching private lessons, and mentoring professional trainers who want to maximize the power of positive-reinforcement training. Kathy is proud to be an original faculty member for Karen Pryor’s ClickerExpos and has taught at twenty-eight of these popular conferences since 2003. 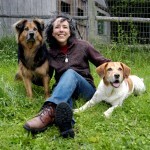 Kathy also has traveled extensively across the United States, Canada and Europe, and to Australia, Israel, Japan and Mexico, educating students about the science of animal training. Her first book, Plenty in Life Is Free: Reflections on Dogs, Training and Finding Grace, was published in 2012. To buy Kathy's book, click on the link below.